I went to my dance class early this morning but burglars had broken into the studio in the wee hours and stolen the sound equipment and the computer. The teacher tried to switch to a Stretch/Strengthen class since it’s hard to dance without music but the police told us we had to leave. So I came home to work, determined to get in a lunch-time walk in the sun (it’s spring at last!). But there was more weirdness. In between web-based staff meetings and conference calls I finalized a fancy email newsletter for the organization and sent it out to 2,000 people. Half an hour later I learned that an important link in the newsletter was broken. I learned more than I ever wanted to know about sub-domains and URLs, fixed the link, and sent it out again. So far no complaints. But no walk, either. Yesterday was weird too. I was determined to finish binding two new journals that I’d started on Sunday, one for general use and one for next month’s International Fake Journal Month. While it wasn’t as hard as the first binding experience, I broke the “measure twice, cut once” rule (measuring only once and so having to cut twice, wasting good binder board and end papers), and ran into a couple of other problems. Meanwhile outside the sun was shining, the best weather in months, and I was sad that I was spending it indoors. Finally I finished the journal binding and went outside. 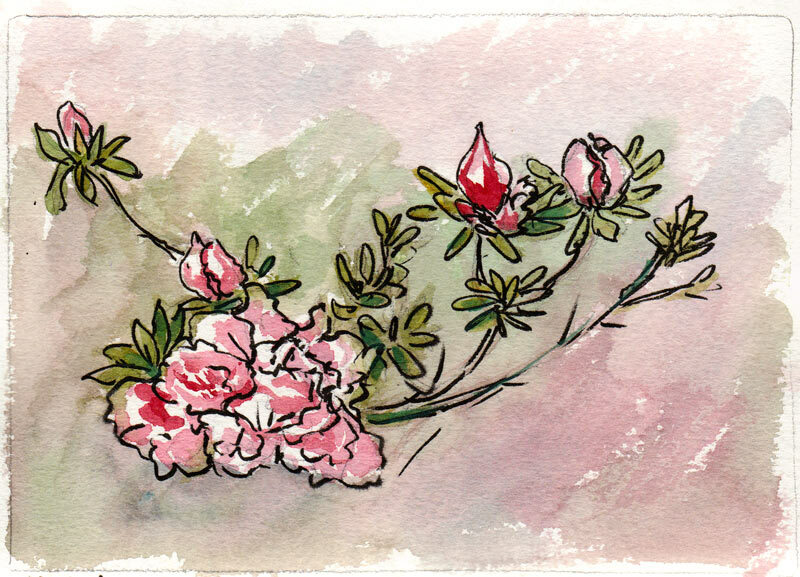 This little plant (don’t know what it is; got it as a gift for my birthday last year and stuck it in the garden) was flowering and looked happy so I sat on the sidewalk in front of my house and quickly sketched and painted a bit of it as the sun went down. The water filter at the top of the post is another broken thing. It used to live on the faucet in the studio sink but it snapped off one day and I couldn’t put it back on. Procter and Gamble (who make PUR filters) sent me a bunch of adapters but none would stay on the threads of the spout. I called my local hardware store and they told me that I was probably out of luck. They said if I tried to just replace the spout it was likely that other parts would get broken in the process. 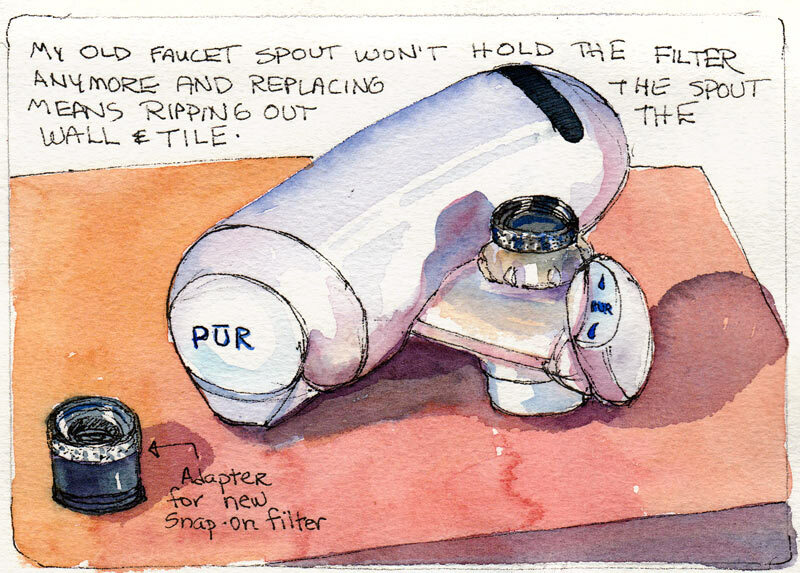 And since modern faucets mount on the sink, not in tile on the wall like mine, I would probably have to rip out the wall, and the old sink, and replumb the faucet, and buy a new faucet. And then I would be broke. So I’ll just continue carrying in fresh water from the filter in the kitchen, 40 feet away. Oh no! The only consolation I can offer is that it seems unlikely to me that anything more can break in your life. Just be careful out there, Jana. And happy St. Patricks day! Wow! When life hands you lemons, journal about it!!! That sounds like a frustrating couple of days. Your plant might be an azalea? (judging from the picture…). and I thought Mercury just went out of retrograde, humm. But at least your talent has not broken, I LOVE the little flowers you did. Great sketches of your broken…biorhtythms…out or orbit cycle, invasion…? But all is well if your ability to capture it all, is still very much in tact! We have a saying in our household, “There is nothing that cannot be fixed by the timely and appropriate application of duct tape.” or, in this case, maybe epoxy! Or plumber’s putty… or packing or all of the above. I am sorry to hear about broken things and weird happenings, but look at a whole picture – the important things are holding together: health, friends, spring… The weirdness happens, but it will pass. And that flower is so lovely.